I use a Synology NAS to backup our two MacBooks. I’ve been ignoring it for 4 years, but a recent hardware failure made me look into it. Oookaaay … that’s an interesting range of permissions. Synology is a Chinese corporation, so this effectively gives Xi the ability to harvest my email. 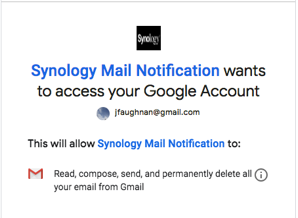 Instead I created a synology user on one of my domain based Google Suites and enabled access there then forwarded to my email. Interestingly my old settings suggested I had gone down the Gmail road at one point. I wonder what I was thinking, in my 2015 post I commented “Synology is a very Chinese product — including off-key English syntax. I wouldn’t install it in a US government facility.” Maybe I started the setup and then stopped? I have a dedicated old-school mail account for device notifications. In addition, I use plus recipient e-mail addresses to distinguish between devices – if possible, some developers have still not gotten the, ehmmm, message that e-mail addresses can contain plus characters. It is of course a - literal - plus if a device asks for an actual e-mail account. More 'modern' devices send out notifications through their own cloud backend. That is still not mandatory with Synology devices. It is also a good idea to enable only absolutely necessary packages. Synolosy's softquare quality outside the firmware and some core packages is doubtful. Many third-party packages are clearly outdated. Exposing any NAS to the Internet certainly takes a lot of courage. Synology is a company based in Taiwan. Xi has no reach (at least for now and the foreseeable future). So you can rest a little easier.